What is Plaque, and Why is it Bad? If you go to your dentist’s office every six months, you have likely heard your hygienist stressing the importance of removing plaque. 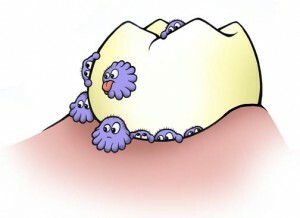 But what is plaque and why is it made out as a monster hiding away in our mouths? It causes your teeth to decay, and if left untreated turns into gum disease. Even the smallest amount of plaque can mix with food, causing the bacteria that’s in plaque to use sugars to produce acids that will remove tooth enamel. All plaque that isn’t removed daily hardens into tartar. Once plaque turns into tartar, brushing and flossing is no longer an option for removal. Your hygienists will have to remove tartar to prevent gingivitis. If gingivitis isn’t treated, gums can shift away from your teeth and cause tooth loss. Plaque is usually the reason for yellow teeth and bad breath. As you can see, there’s nothing good about plaque. While the damage it does to your teeth and gums is bad enough, there’s more! Plaque also activates your immune system chronically and leads to inflammation in the body for long periods of time. This causes premature aging and can develop into autoimmune diseases. You can avoid the buildup of plaque by brushing your teeth at least twice a day for three minutes each time and flossing around your gums daily. Sonic toothbrushes have also proven to be a lot better than manual toothbrushes in the removal of plaque that has built up over time. Routine dentist appointments should be kept so that plaque buildup doesn’t become excessive.